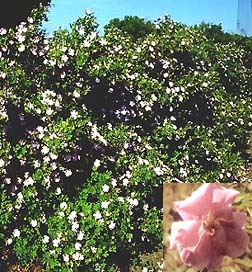 Heavily scented large flowers usually deep pink to white, June to September. This rose grows at a rate of up to two feet per year and will grow up to 6-feet tall. This plant is excellent for hedges. Completely disease resistant and winter hardy to Zone 2. Suitable for any soil and conditions. Plant 12 to 18 inches apart in the row to create a fast growing hedge.